In February I joined a group of Sri Lankans travelling to the northernmost point of Sri Lanka. This has only been possible since the end of the bitter civil war between the Tamil Tigers and the Sri Lankan government in 2009. 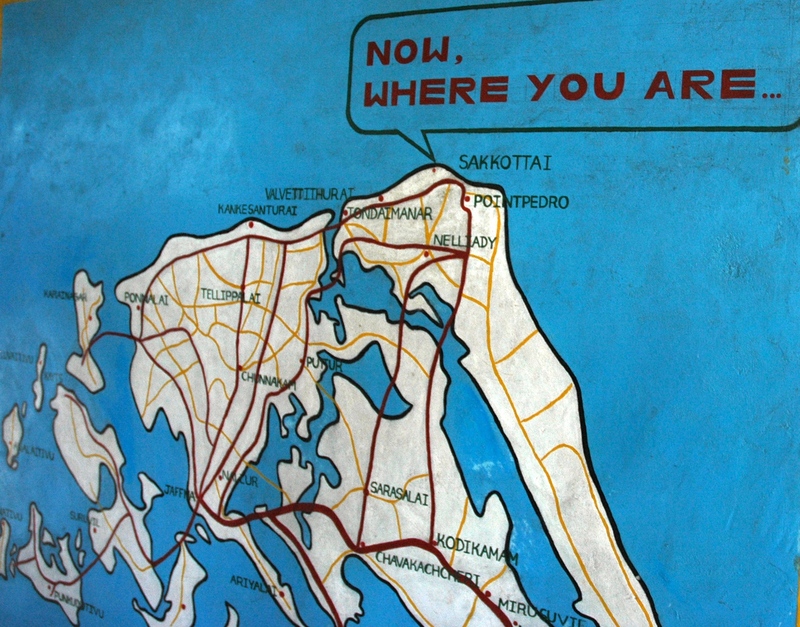 From Jaffna, where we were staying, the big blue coach snaked its way north along Kankasanthurai Road to the edge of the narrow Palk Strait across which is Indian Tamil Nadu. Compared to the lush parts of the Jaffna Peninsula with vineyards and apple orchards, the parched land further north was covered in thorny shrubs and studded with palmyra trees. 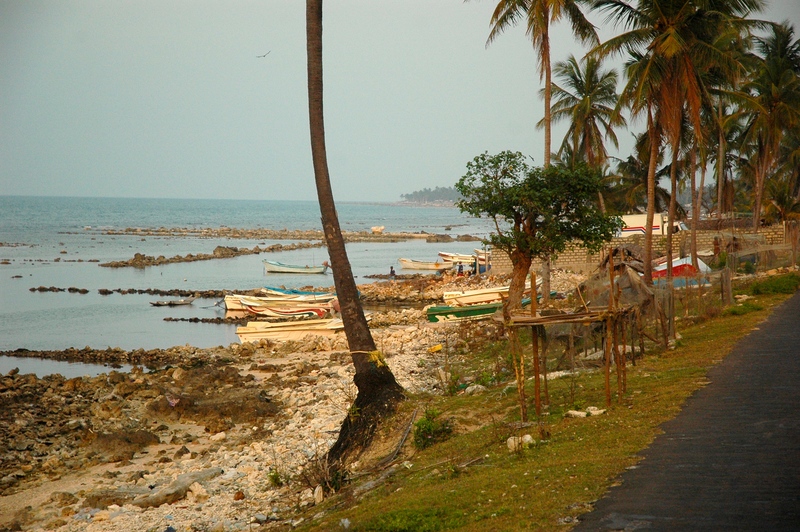 We drove east on the coastal road to Valvettithurai with its placid blue sea and rough coral beach where brightly painted boats were lined. It used to be the smuggling capital of Sri Lanka. The fancy sarees that were brought across from India dressed thousands of Sri Lankan brides for decades. The area is now controlled by the Sri Lankan navy. 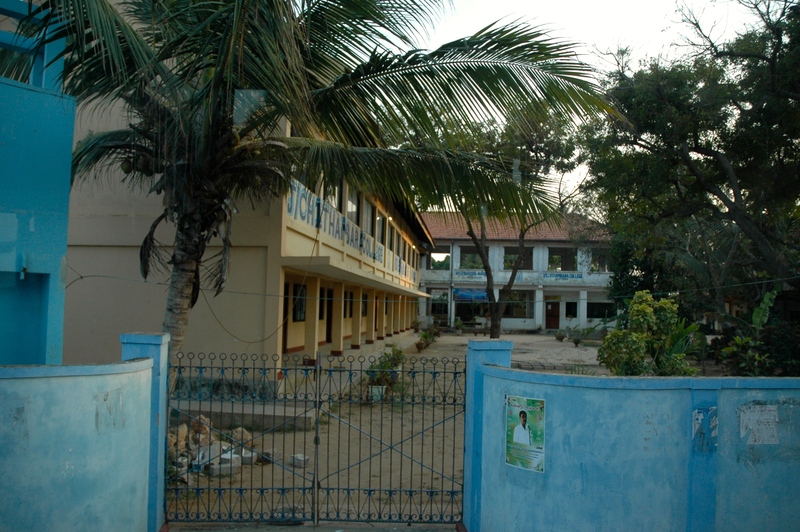 As we drove through the town, the Tamil guide pointed out the school where the Tamil Tiger leader Velupillai Prabahkaran studied. The guide offered to show us the ruined house of Prabahkaran’s parents. Those in the back of the bus yelled “No!” We drove on to Point Pedro. We passed small fishing villages and crossed steel bridges and as the light began to fade, arrived at Sakkottai. Many think the northernmost point of Sri Lanka is at Point Pedro, a few miles further east but an easily missable stark, concrete sign on the rocky beach proclaims to the world where the true north is. A large map in an open sided shed reminds visitors where they actually are. Point Pedro used to be a cotton growing area and the small harbour was used to export cotton to Tamil Nadu. First the Portuguese, then the Dutch and finally the British ruled the area in Sri Lanka’s colonial period. The area has been under the control of the Sri Lankan army since it’s capture from Tamil Tigers in 1995. The 2004 tsunami devastated most of Point Pedro. It was already dark when we reached the lighthouse. 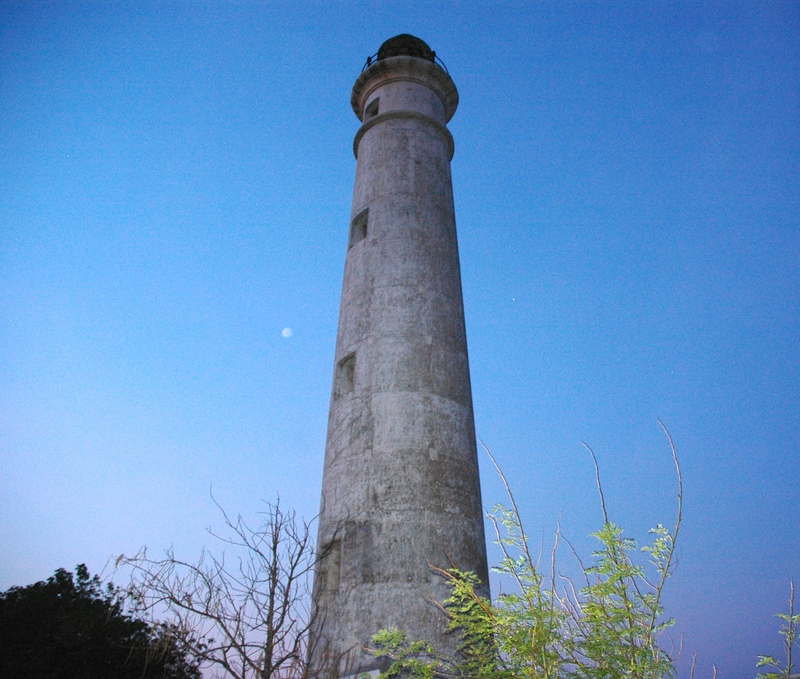 The 31 metre high white pillar built in 1916 no longer blinks. It is now occupied by the Sri Lankan navy. The commanding officer was charming and welcoming and addressed the retired Air Force officer in our group “Sir” with great respect. The beach next to the lighthouse looked pristine with white sand at the edge of blue waters and appeared to stretch for many miles. It is 432 kms. to Dondra Head, the southernmost point of Sri Lanka but that’s another story.